The Amish are known as a secretive society — outsiders may be curious, but it’s hard to observe their customs and culture firsthand. That’s why I took a trip to Lawrence County, Pennsylvania during my long Thanksgiving holiday in Pittsburgh. I’m constantly searching for inspiration and new material as I write books 3 and 4 of the Amish Hearts series. Lawrence County is about an hour north of Pittsburgh, and it’s home to two major Amish communities, New Wilmington, the setting of the Amish Hearts books, and Volant. Both of these small towns contain a mixture of Amish and “English” families. So, it’s not unusual to see an Amish man walking toward a pizza shop, or an Amish buggy in a public parking lot. In fact, the bank in Volant actually has a parking area especially for Amish buggies. 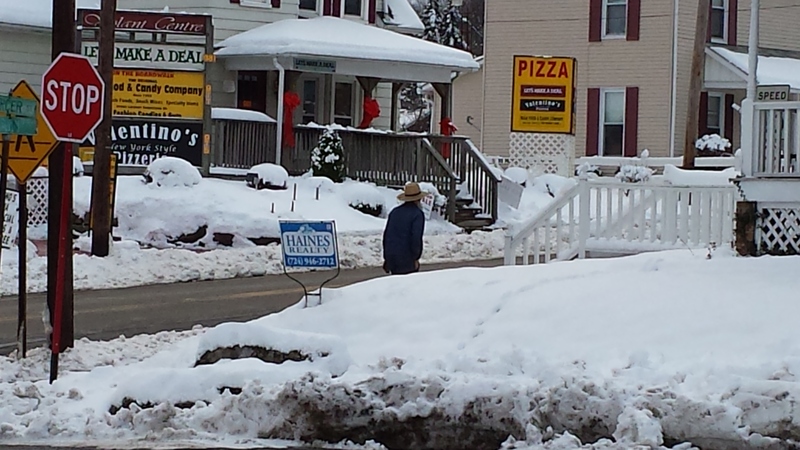 An Amish man walks in downtown Volant. This Amish buggy was parked outside the bank in downtown Volant. Our first stop was Teena’s Quilt Shop, a family-owned business in Volant. It was about 35 degrees that day, and the entire store was heated by a wood-burning fireplace. The Amish in the area are Old Order, the most conservative sect, and they do not use electricity or central heating. We found fragrant handmade soaps, elaborate quilts and blankets, and adorable little Amish rag dolls, which had no faces. The Amish craft dolls with blank faces for the same reason they will not pose for pictures: the biblical book of Deuteronomy prohibits the creation of “graven images.” Many Amish don’t seem to mind candids, but posed pics are off-limits. Some Amish, however, are very camera-shy. The woman working at Teena’s, for example, even dissuaded us from taking pictures of the buggies outside. We tried our best to learn the ways of the Amish without being too intrusive! Amish buggies parked for the day. When we purchased our items, the register transaction was done the old-fashioned way: cash only, and hand-written on a receipt. The Amish woman manning the register was pleasant but rather shy, which was the norm among the Amish we encountered during the trip. They make business transactions with the “English,” but seem to prefer keeping the relationship professional. We learned a lot more about the Amish through local merchants who deal with them on a regular basis. For example, the Amish Peddler has handmade furniture, and the store employees interface with Amish from Pennsylvania and Ohio. The local “English” are a rich source for anyone who might be curious about the Amish. In front of the Amish Peddler, a gorgeous store full of handmade Amish goods. “English” and Amish teamwork at its finest! We also drove the back roads, encountering two Amish buggies, which quickly turned the other way when we arrived on the scene. We also saw completely random but interesting things. For example, the Amish hang their clothes outside on a line to dry, even in the winter! 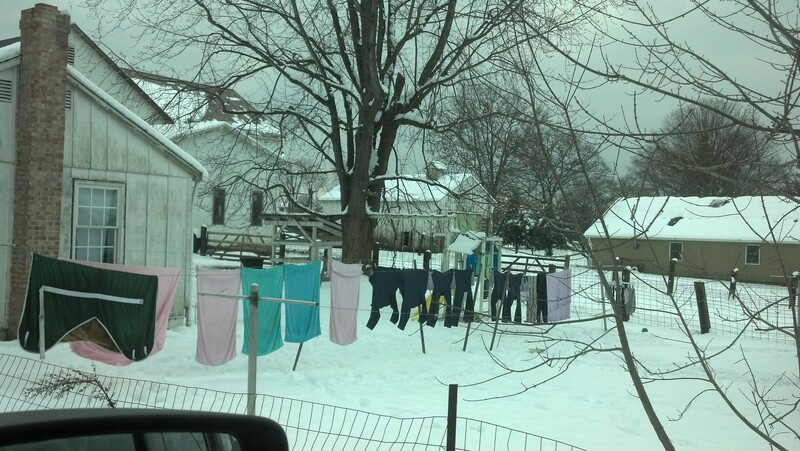 The Amish hang out their clothes to dry even in the winter. My Amish field trip inspired me, and gave me so much material for Books 3 and 4 of Amish Hearts. Observing the way the Amish conduct their businesses will be invaluable as I write my next book about Rebekah’s sister Mercy, who works in a bakery. I was also interested to notice the avoidance of any kind of “media” by the Amish, and will certainly incorporate that theme into the books. My trip to rural Pennsylvania was so stimulating because it allowed me to experience an entirely different culture just an hour from my parents’ house! So true! It’s crazy to imagine even the little things like bringing in freezing cold laundry instead of pulling some nice warm blankets out of the dryer on a chilly day! Very cool! We went to Lancaster for a wedding a few years ago & one of the activities we did during the weekend was go on an Amish buggy ride (the horse’s name was Jebediah, cutest horse name ever). It was a lot of fun, but I really got a new respect for keeping a distance in my car while passing the buggies on the road – I don’t know how the horses take it in such stride! And at the end, the kids of the guy who ran the tours came out and brought us all homemade rootbeer and whoopie pies. Best rootbeer I’ve ever had! Thanks. 🙂 Research field trips are fun! Your trip to Lancaster sounds amazing. The Amish are such an interesting culture to experience firsthand. I would love to check out Lancaster for research field trip part 2!